It was red meat for the biotech base. 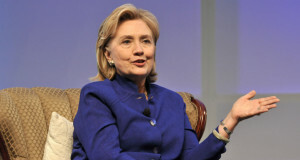 Hillary Rodham Clinton, in a 65-minute appearance at the BIO International Convention on Wednesday, voiced support for genetically modified organisms and possible federal subsidies to keep U.S. companies from leaving for tax havens abroad. 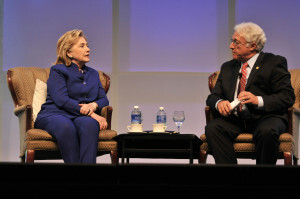 Clinton told thousands at the San Diego Convention Center she understood what stage partner Jim Greenwood, the BIO CEO, called the “high-risk, high-reward” nature of the industry. “Maybe there’s a way of getting a representative group of actors at the table” to discuss how the federal government could help biotechs with “insurance against risk,” she said. She said the debate about GMOs might be turned toward the biotech side if the benefits were better explained, noting that the “Frankensteinish” depictions could be fought with more positive spin. But Clinton also noted the gap between state efforts — such as California’s in stem-cell research — and federal steps taken for biotech. Minutes earlier, Gov. 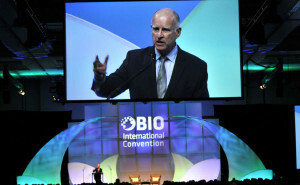 Jerry Brown made a rousing 3-minute pitch for companies to see California as biotech-friendly. 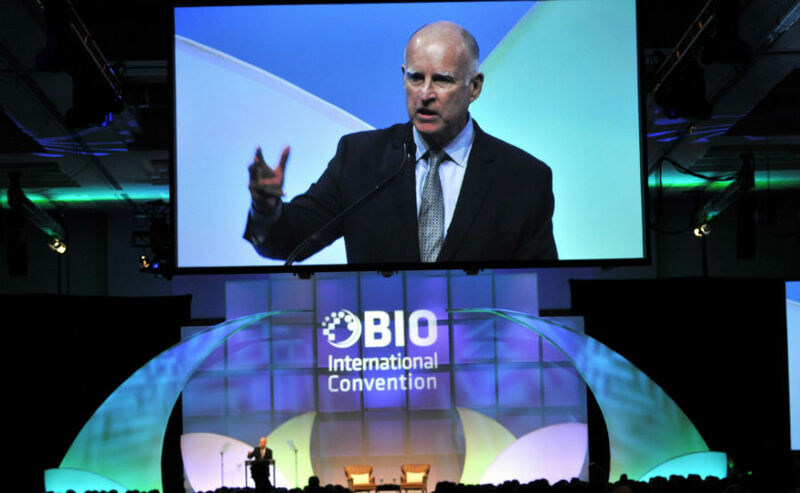 Brown had some competition for biotech boosterism in the form of Virginia Gov. Terry McAuliffe, the longtime Clinton ally who pitched his own state as best for biotech. Hillary Clinton was quizzed by former GOP congressman Jim Greenwood, the CEO of the Biotech Industry Organization. 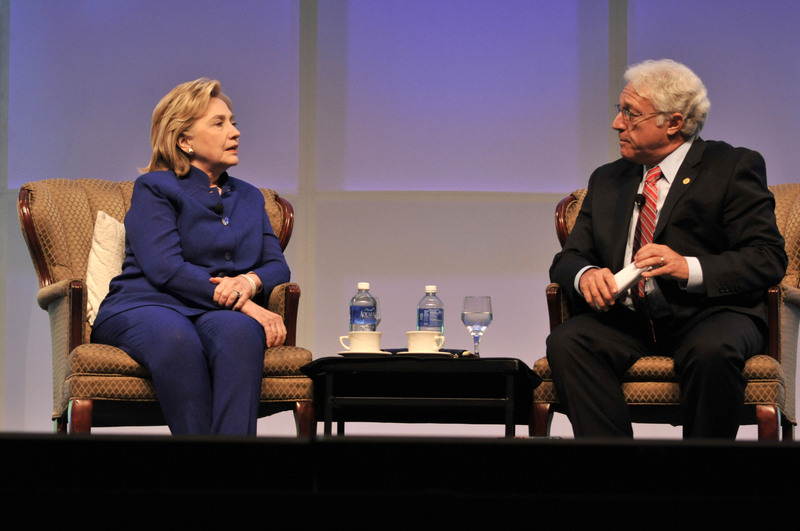 In an easy chair conversation with Greenwood, a former Republican congressman from Pennsylvania, Clinton also was pitched questions on foreign policy, women’s roles and climate change that brought sporadic applause. Her answers and confident delivery underscored wide interest in her San Diego visit as she moves closer to a decision on whether to make a second run for president. Earlier, she signed books at Warwick’s in La Jolla, where 1,100 people in line were given wristbands for a chance to meet the former first lady. Given a standing ovation at the start and end of her appearance, Clinton responded to Greenwood’s opening pleasantries by saying: “I’m doing well, and I’m not going to cut your tie,” a reference to Sir Richard Branson’s playful act the previous day. Answering a question at the BIO conference about the Russian president, Clinton recalled Vladimir Putin’s announcement in 2011 that he would once again become the head of that nation’s government. “You’ve got to love that version of politics — it’s so clean, and it doesn’t cause any fuss, and nobody has to campaign for anything — just get on the stage and make an announcement,” Clinton jokingly said. “Something you could do on this stage,” Greenwood shot back. 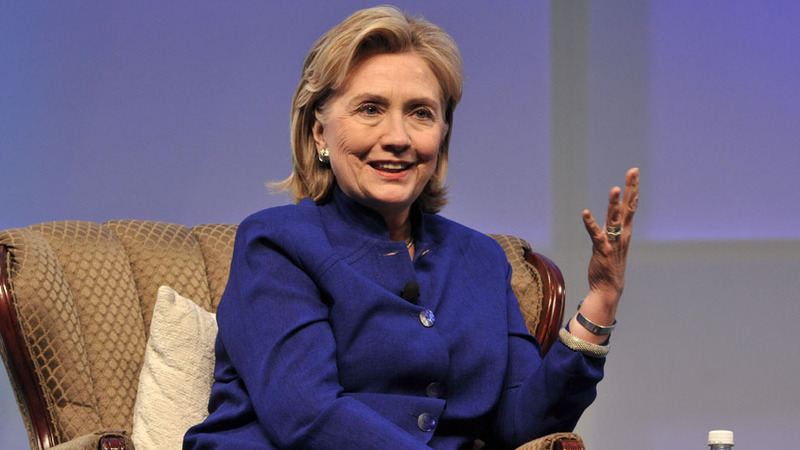 Clinton has come under criticism over the past couple weeks for commenting that she and her husband were in debt when they left the White House because of legal bills, without noting pending multimillion-dollar book deals and other prospects that would benefit them financially. 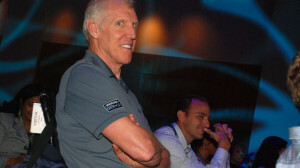 On Monday, former President Bill Clinton defended his wife’s commitment to the poor and said she was not out of touch. 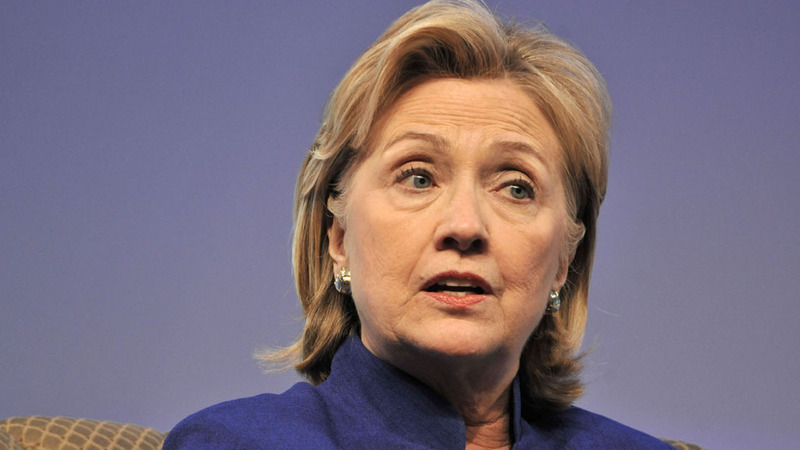 The controversy arose from reports that the Clintons charge appearance fees around $200,000. A spokeswoman for the BIO conference did not respond to a question of how much Hillary Clinton was being paid for appearing at the luncheon. CNN reported that the book tour for her memoir has resembled a political campaign, run by campaign operatives instead of book publicists. “Hard Choices” includes her views on the 2012 attack on a U.S. diplomatic compound and CIA base in Benghazi, Libya, that killed four Americans, including three San Diegans. She also discusses her dealings with Putin. She said at the BIO convention that the Russian leader wants to rebuild influence in neighboring countries and has no problem using “intimidation” to get his way. “He’s someone you have to stand up to,” Clinton said. She also talked about global warming, bio-engineered food products, challenges posed by China, negotiations over Iran’s nuclear program and recent turmoil in Iraq. She laid the blame for the renewed insurgency in Iraq at the feet of Shiite Prime Minister Nouri al-Maliki, who purged Sunni members of the government from power. The only solution to the current crisis is to get al- Maliki to make changes that inspire Sunni support, she said. Clinton said she doesn’t think he will take such action. “My point has been the United States should not be committed to doing very much at all, unless we have a clear understanding of what Maliki is going to do and what role Iran is going to play,” Clinton said. She said the United States doesn’t want to support only one side in the conflict. She said there are too many questions that need to be answered before she would back any action beyond President Barack Obama’s order to send as many as 300 military advisers to the strife-torn country.